Last Monday was the start of the 100 hexies 100 days challenge on IG and the theme for the first week was "all about me." Each day all of us participants have been sharing something about ourselves along with our hexie for the day. One lady shared that she loves taking pictures of flowers in her garden and she shared a collection of her pictures. The last one is a close up of what looks like a dandelion puff in silhouette and it is gorgeous. You can see it here, just click to the last picture. I kept staring and staring at that picture, thinking about how dandelions are usually considered weeds, something to be pulled out and discarded. Her change in persepective, though, was so different from the normal view that it made the dandelion puff stunningly beautiful. And that led me to think about how God's perspective on our circumstances is so different from our normal view. Romans 8:28 says, "And we know that God causes everything to work together for the good of those who love God and are called according to his purpose for them." Let's note, first of all, that Paul is not saying that everything in our lives is good. Illness is not good. The death of a loved one is not good. Accidents are not good. Poverty is not good. There is no debate there. We would like for everything to be good and rosy and perfect every day of our lives, but we all know that isn't our reality. There is no way to avoid trouble. It's part of living in this world where sin exists. But God can use everything, even those things that aren't good in and of themselves, to create good in our lives. His perspective is different. It's not that He looks at those things and sees them as good, as I said, but rather that He also sees how He can use them to create something good for us. Our perspective is limited to the here-and-now. We see how something is right now - the pain, the uncertainty and the fear. We can't see where today's circumstances are leading us, but God can. He sees not only today, but also all the days we will ever have. I have heard people say that their illness brought them closer to God or made them more appreciative of the people around them. I have heard of hardships bringing families closer together and of people losing their jobs only to find a new career path that was so much better than where they were before. 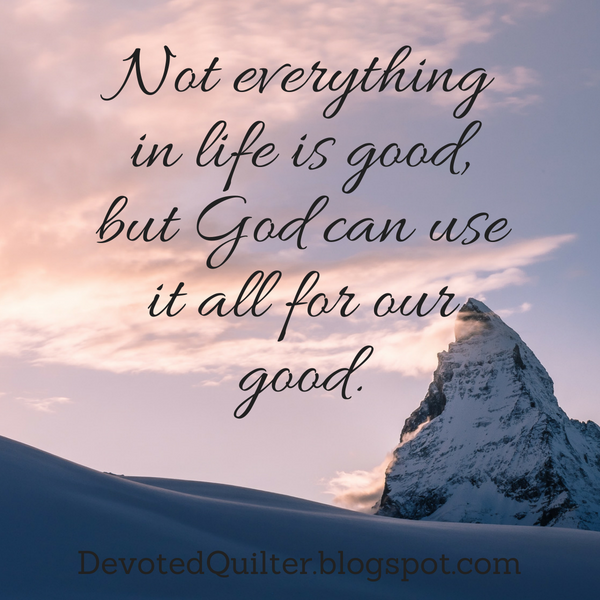 Not everything that happens in life is good, but from His different perspective, God can see how to use it for our good. We've all been praying for cooler weather as our high two weeks ago were 110+ Then someone started a fire that quickly has grown and covered us with smoke. The temp dropped 3 degrees in a matter of minutes that day. Plus off the coast a hurricane raced NW. It brought the humidity that the firefighters needed.